It’s big news that raises a lot of questions. One is if this new trilogy means that the saga stories—the ones with “Episode” in their title—will be ending after J.J. Abrams’ Episode IX, or if this separate trilogy will take the place of the standalone movies—Rogue One, Solo, and the possible Obi-Wan Kenobi movie—once they’re all finished. Another question is what “a corner of the galaxy that Star Wars lore has never before explored” means. The old Star Wars EU left very little unexplored, so if Iger meant “never” literally, then that would be something incredibly far in the past, incredibly far in the future, or from a location so far away from anything we’d recognize as Star Wars. If Iger meant “unexplored” as “left alone by the new canon,” that opens things up considerably. Disney has locked the new canon into stories set just before or just after the extant movies. That leaves open things mentioned but not “explored” by the new canon. This feels slightly more likely than movies set in the Star Wars universe but barely recognizable as such. If that is the case, then there are a few options that would make sense, given what we already know, in the form of “unexplored” stories from the vast history of the old Expanded Universe—elements of which have already been borrowed for the new canon over the course of Rebels, the comics, and the movies. This would be the ultimate “have your cake and eat it” of promising a new Star Wars saga, but one that still feels like the Star Wars we’ve currently got—Empires and Republics, Sith and Jedi, the endless battle for good and evil. The era of the Old Republic is removed thousands and thousands of years into the past of the Skywalker Saga, to the point it would definitely be something Johnson and Lucasfilm could describe as being Star Wars lore that’s never been explored... in Disney’s new and updated canon, at least. In the old Expanded Universe, the Old Republic era was stretched across a phenomenally massive period of time. Officially, it was the period between 25,000 to 5,000 years before the events of A New Hope. It’s a time that mostly dealt with a concept we only really saw briefly in the prequels before everything went downhill: a grand Republic in an era of (mostly) peace, defended by a Jedi Order at the height of its power. But back then the Republic was not the only dominant power in the galaxy. There were the Mandalorians, who frequently warred with the Old Republic, and the vast Sith Empires—factions of Dark Jedi who’d been kicked out of the order for studying the Dark Side, only to embrace it and create their own societies and alliances across the galaxy, creating two forces of power. But fans of the EU will mostly be familiar with the Old Republic thanks to video games, specifically the beloved Knights of the Old Republic duology from developers Bioware and Obsidian. 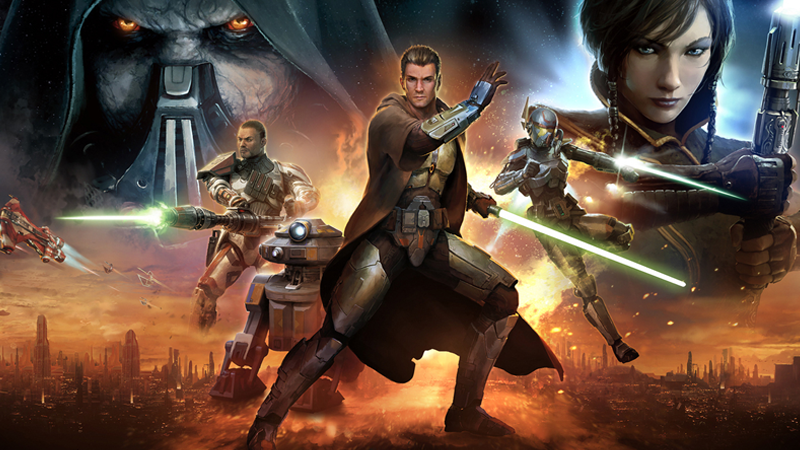 These games (the story of which was eventually continued in the currently-ongoing Massively Multiplayer Online RPG The Old Republic, which, despite still being an active, officially licensed project, has a murky relationship at best with the Disney canon) were set about 4,000 years before the Skywalker films. They dealt with a resurgent Sith Empire striking out at the Republic in an attempt to surprise the ailing union of star systems and a scattered Jedi Order, only to be beaten back by a reformed Jedi who once led the Sith as Darth Revan. The sequel followed another group of characters five years after the events of the first game, after the Sith had seemingly destroyed most of the Jedi Order. The Knights of the Old Republic games are widely beloved—when it comes to Star Wars games, they’re often considered some of the absolute best, and a firm favorite of Expanded Universe fans. But the Old Republic period at large has largely remained untouched by Disney, and whenever there’s even the faintest of hints that could imply story beats from that era being brought back into the canonical fold, fans go wild for the possibility of KotOR being returned to “official” prominence. Over the past few years, some loose elements of its timeline in the EU have been brought over in the vaguest sense to Disney’s canon—but moved up to around 1,000 years before A New Hope. 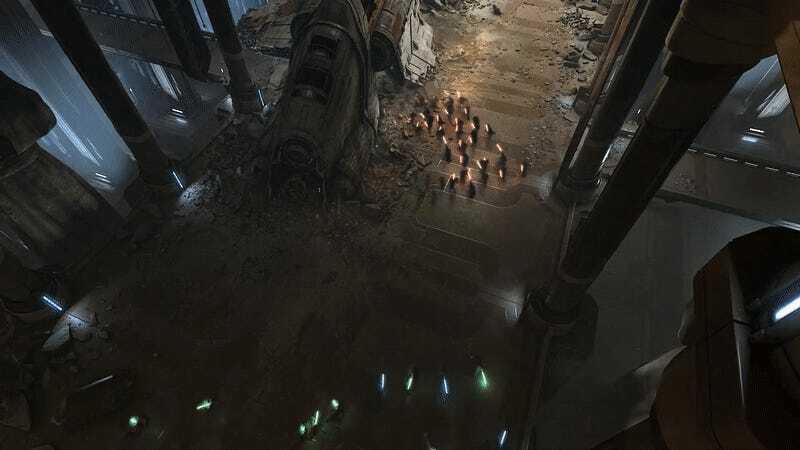 That’s when we know the Old Republic was reformed into the Galactic Republic in the wake of a Jedi-Sith War, the remnants of which were teased in Star Wars Rebels’ second season. If Johnson’s trilogy is set in that period a thousand years (or more) before the Skywalker saga, its unlikely to borrow that much from the Knights of the Old Republic games, as neither Johnson or Lucasfilm would want to be beholden to stories they didn’t oversee themselves. But simply taking that period and the loosest elements we’ve already had hinted at in Disney material offers a huge amount of untapped potential for Johnson to explore, something that can still both be familiarly Star Wars while feeling entirely new. Planets we know of, like Coruscant and Alderaan and Mandalore, could probably still play a part, but they’d be far removed from what we know of them in the current movies, while introducing what would be new locations to many, like Taris or Malachor (two places already name-dropped in current material). If anything, the Old Republic would in a way give Lucasfilm a chance to “re-do” the prequel concept and make it its own. The mixed reaction to the prequel movies has led to the pre-Luke Skywalker era being mostly ignored by Lucasfilm and Disney, with new material expanding upon the eras of the original movies and beyond a lot more than the time before it. The chance to craft their own take on the concept and explore further into Star Wars’ past must surely be a tempting idea. With reference to current movies, the Unknown Regions are where the First Order rose out of the ashes of the Empire, as the remnants of the Imperial fleet headed there after signing peace accords with the New Republic. Starkiller Base was created out of a planet in the Unknown Regions. All of this backstory involves characters we know, so it’s unlikely Johnson’s new trilogy touches on that particular part. However, we do know that Emperor Palpatine was obsessed with the Unknown Regions, believing some Dark Side presence waited for him out there. He built a secret observatory on Jakku to help him calculate a path through the “solar storms, rogue magnetospheres, black holes, gravity wells, and things far stranger” that make mapping the Unknown Regions so difficult. The calculations were completed after Palpatine’s death and used by the rest of the Empire to travel there. The dark presence sensed by Palpatine is largely believed to be a reference to Supreme Leader Snoke from the new trilogy. A set of movies about the place Snoke came from—and perhaps not about him specifically, to avoid a character we’ve met already—isn’t out of the question. The mysterious nature of the Unknown Regions and the weird things that inhabit it are a fruitful setting for a new trilogy. We’ve seen Star Wars use that before, when the old EU introduced the invading aliens the Yuuzhan Vong. That run of stories was divisive, but it did at least introduce an element beyond the Republic, the Empire, the Jedi, and the Sith in various forms. Johnson’s new trilogy could be based on something similar. The most established bit of the Unknown Regions involves possibly the most famous use of the EU in the new universe: Grand Admiral Thrawn. Thrawn’s people, the Chiss, control a chunk of the Unknown Regions through the Chiss Ascendancy. We know from Thrawn that, like Palpatine, Chiss leadership was concerned about a growing threat in the Unknown Regions. Thrawn’s assignment, in fact, was to determine if the Empire was a suitable ally against that threat—or, if not, to weaken them enough that the Empire presented a more tempting target than the Ascendancy. Thrawn, being Thrawn, accomplished this goal by joining the Imperial Navy and then swiftly rising through the ranks to attain the highest possible title. In that role, he provided Palpatine with information about the Unknown Regions, save anything about the Chiss homeworld and their bases. The only Chiss we have actually met in the new canon are Thrawn and, very briefly, a character named Admiral Ar’Alani. (Ar’Alani met a human Thrawn sent to them as an ally.) But the Chiss are an important factor in the Unknown Regions and, of course, popular with the fanbase. That said, it would be similarly weird to head out into the Unknown Regions and ignore the Chiss. They’ve been established as a power out there, they’re popular, and they’re the source of a lot of information about that area of space. Plus, they’re not that hard to create for screen: red eyes, blue face, done. Including the Chiss as part of a story set in the Unknown Regions is a slam dunk choice here. The rest of the knowns about the Unknown Regions are a) that the system of Ilum, a source of the kyber crystals found in Jedi lightsabers, is out there; and b) the existence of the planet Rakata Prime. Rakata Prime was first introduced in the no-longer canon video game Knights of the Old Republic as the homeworld of a species that, way back when, ruled as the Infinite Empire. Sending a group of people off to the Unknown Regions, à la the old EU’s Outbound Flight, to encounter brand new things could easily be a story used in the new trilogy. Likewise, it could be a story set among the Chiss or some brand new society, to see what the Republic and Empire look like to those outside them. And, of course, there’s wherever Snoke came from and whatever Palpatine and the Chiss are terrified of. Going even further afield would be a story set in Wild Space—places completely off the map of the Star Wars galaxy. To set something there would almost have to involve some people from places we know heading there, otherwise we’re seeing things that are completely divorced from what we know as Star Wars. The Unknown Regions and the early history Old Republic are things we know exist, but know little about, which make them obvious places to start setting a new Star Wars trilogy. Wild Space and/or a far-flung future way past the movies we’ve already seen are truly corners unexplored. The first would contain places and aliens we’ve never imagined, untouched by the events of the movies. The second would see our beloved characters reduced to myth even more than they are already. There is a precedent for Star Wars’ far future being explored in the Expanded Universe, in the form of the Legacy comics—set 130 years after the events of the original trilogy that explored a world where the New Republic had collapsed and a new Empire had taken its place again—but it’s likely that the future of Star Wars is out of bounds for a trilogy of new movies, simply to leave wiggle room for Skywalker Saga films that will inevitably continue where Episode IX leaves off. The other, less interesting options include something the current media beyond the movies is already doing bits and bobs of, like setting things on a planet we’ve never heard of before that is still within the mapped galaxy (as Star Wars Rebels did with Lothal), or telling stories about fringe characters who have little if any connection to the heroes and villains of the movies, trying to make their way in the galaxy between the huge events of the Skywalker saga. These options would be safe, a way to connect these new films to the iconic Star Wars movies as a safety net—a lot like the Star Wars Story anthologies we have at the minute. But they’d also be more of the same, and a wasted opportunity to do something that feels really new in comparison to what we have in terms of ongoing Star Wars material right now. Plus, as much as fans may want more low-key Star Wars stories away from the Empire and Rebellion or the Jedi and Sith, a new movie trilogy is probably not the place for them. No one wants three two-hour movies about moisture farmers on Dantooine in the days before Leia tells Grand Moff Tarkin that’s where the secret rebel base is. At the moment, we know nothing about these films beyond the fact that they’re happening, with Rian Johnson as their architect. They could end up being similar to one of the options we’ve outlined above, drawing on the vast materials left behind in the Expanded Universe to explore a new chapter of Star Wars on the big screen. Or they could be something entirely different, beyond most fans’ expectations, and truly be something that is new to Star Wars—something it arguably really needs right now as the franchise goes over and expands upon its most beloved aspects (namely, the original trilogy) for new material. For now, all we can do is wait and see where Disney and Johnson want to take the galaxy far, far away next.